I was recently fortunate enough to encounter Pembrokeshire Falconry at Picton Castle, as part of a trade day with Pembrokeshire Tourism. I had already bought an ‘Owl Walk’ as a gift for my parents as a Christmas present, but we had yet to use it, so this was a great way to see what might happen at Picton Castle. The venue for our hawk adventure was Picton Castle, a fairytale castle just outside of Haverfordwest, which is open to the public giving guided tours and has 40 acres of ground to explore, plants to buy and a fabulous cafe serving the best Tapas! If you look back through my blog, you’ll see a piece written on my visit there last year. As you take the walk around the grounds of Picton Castle and through their woods, you are given a history lesson and will be amazed at the facts that you will encover…so many of our sayings and words are derived from Falconry over the ages. For instance, ‘mantle’ as in the mantle over the fire place- mantlepiece it went onto be, is derived from Falconry. When the hawks(and I saw this myself) go in for a kill, they spread their wings right out and around their prey to stop other birds pinching it, this is called mantling, and you can see how the form they make is similar to that of a mantlepiece over a fire-I’ve taken a picture of it, just as the hawk was landing. The hawks, when I watched this were following a dummy rabbit that the guys in Pembrokeshire Falconry had trailed on a piece of string to make it look like a real rabbit from above! Other phrases such as ‘under the thumb’ , ‘wrapped round his little finger’ and ‘old codger’ all come from Falconry, but I will leave you find out how they came about when you take your own Hawk or Owl Walk! Pembrokeshire Falconry can be found out and about around the county, offering displays at other venues as well as individual events-if you get a chance, then do take the opportunity to get involved. making of many different sorts-we started with a wholemeal, then soda bread, then bread sticks, then a tear and share pesto and garlic loaf and lastly we came away with a sourdough loaf in it’s own proving bowl made and ready to prove overnight in our own fridges, so we could take it out the next morning, bake it and offer it to my guests! The heat of the car coming home however, made it start to expand to such a degree that Sue(my B&B friend that also nabbed a place) & I were concerned we were going to be smothered in sourdough! I’m pleased to report that it survived and baked well the following day..guests most appreciative! 10 Apr Would Henry Tudor like my Breakfasts? April and it’s blue skies, so a very keen guest decided to get out on thePembrokeshire Coast Path, which we are situated on, and enjoy an early morning run before coming back to one of my Award Winning Breakfasts-‘Pembrokeshire’s Finest Breakfast’, no less-as judged by Pembrokeshire County Council for the Pembrokeshire Tourism Awards in April last year. The route my guest took was across the circular walk at Dale, encompassing St Anns Head-just under 8 miles and takes in some great history. For those of you that have enjoyed the BBC Drama The White Queen and then the books of Phillipa Gregory, this is a must do walk-personally, I wouldnt be running it! You may remember in The White Queen that the other ‘Margaret’-Margaret Stanley (not the Red Queen) had a son, Henry, in Pembroke Castle-husband died and she married Lord Stanley, while at the same time her son took refuge in France with Jasper Tudor (his Uncle). In the WQ eventually Richard takes the crown after his brother (the King) dies and the other brother being drowned in a vat of red wine. Well, HenryVII, once he has grown makes sail to land in Wales and has in mind to take the Crown. The route taken today by my guest takes in Mill Bay, where Henry VII landed in 1485 and then made march through Wales and across England, gaining support as he went, to finally defeat Richard III at Bosworth. I am sure the coastline hasn’t changed much from when Henry landed, and to imagine 55 Ships and 4000 men coming ashore at Mill Bay and making their way along the Coast Path up towards Aberystwyth, is astounding when you are actually there. It must’ve been such a difficult trek, especially with all that armour and the supplies they must’ve needed! If I had been open back then, perhaps Henry would’ve liked to have had one of my breakfasts to sustain him through the day! 3 cheese fondue with mozzarella, cheddar and feta with homemade mexican style chorizo, spicy tomato salsa and crispy flour tortillas. Quality food was evident throughout the night. Mango, lime and star anise granita. Then onto the last course, a scrumptious avocado and spiced green apple puff pastry parcel with smoked peach sorbetto. For me, the smoked peach was a bit too smoked, but I am not a fan of smoked foods normally! Halen Mor pride themselves on offering good quality food, rather like myself with my Breakfast produce. I believe that if you start with good quality ingredients then, hopefully, you can always improve your food further! Adam, the chef, prides himself on producing great plates for diners to enjoy and like myself with my breakfasts, I like to see empty plates coming back into the kitchen! Halen Mor opened their doors a little before Christmas 2013 and have already built up a good following of foodies and regularly hold Communal Dining Evenings- the next one being Greek on 8th, 9th & 10th April. Their phone number is: 01646 693017. If you’re interested in going then do ring up and book your table early as these seats do go quickly! Andy Davies runs photography workshops in our area, a few of Andy’s students have stayed with me and have praised his skill and patience when dealing with all levels of photographer. I have included here his list of workshops if you fancy improving your photography skills-and of course, you can stay with me here in Fields Lodge whilst you undertake them! 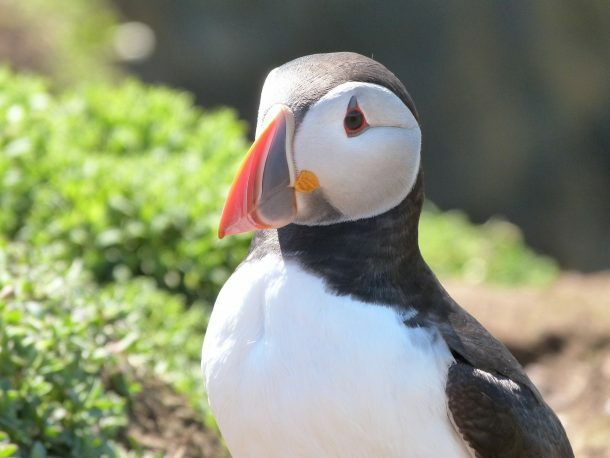 Join professional Welsh photographer and lecturer, Andy Davies, for an unforgettable day on Skomer Island learning how to use your digital camera to capture the stunning landscapes and rich wildlife. This is a truly world class destination and the memories will stay ingrained for a lifetime. The unique experience of being within inches of the iconic puffins will remain ingrained forever and one can just imagine Sir David Attenborough commentating in the background. Andy provides hands-on expert tuition to small groups who are guided in taking control of their camera to capture memorable images. Whether a complete beginner, enthusiast, aspiring professional or seasoned photographer, Andy provides comprehensive tuition to suit all levels in a relaxed and enjoyable atmosphere. There is plenty of time throughout the workshop for one-to-one tuition when topics of your interest can be explored. The Workshop is run in association with the Wildlife Trust for South and West Wales and Dale Sailing so participants by special arrangement have pre-booked, guaranteed places on the first crossing of the day on the Dale Princess, returning on the last boat of the day giving us as much time as possible on the island. We have privileged use of the library in the Warden’s House to review images on a computer if we need to shelter from a shower. Workshops begin in April when the puffins, guillemots and razorbills are busy building nests and courting and the beach in North Haven is crammed full of Atlantic grey seals. An unmissable landscape panorama unfolds in May when the island is covered with a carpet of bluebells and red campion. The end of May to mid-July is the time to capture the iconic shot of a comical puffin with an impossible number of sandeels crammed in its beak. The last couple of weeks of July may afford the opportunity to see a puffling exercising its wings at the entrance to the burrow. See here for a Year in the Life of a Puffin. There is still plenty to photograph in August with herring and lesser black-backed gulls often posing on rocky outcrops. We tend to explore the whole island at this time of the year giving an opportunity to capture the great landscapes around the coast. The year culminates in the seal pupping season from late August through to the end of October. For recommended accommodation see here and for a video of Andy giving a workshop on Skomer click here. News and images can be found on Andy’s Facebook page here. Workshop reviews from participants can be found on Tripadvisor here. The National Trust’s Stackpole National Nature Reserve is the venue for a day in the company of Welsh profesional photographer and lecturer, Andy Davies, who will provide hands-on expert tuition to small groups who are introduced to the essentials of creative photography. This is an exceptionally diverse wildlife location offering one of the best chances to photograph a resident family of otters in the UK. The Bosherston ponds are at their best when the lilies are in flower at the end of May and the woodlands are carpeted in bluebells and wild garlic. Other subjects of interest are herons, mute swans, damselflies, dragonflies and butterflies. Awe inspiring landscapes abound with Barafundle and Broad Haven being two of the most picturesque beaches in Wales. The autumn woodland colours are spectacular and make for superb landscape compositions when reflected in the ponds. Whether a complete beginner, enthusiast, aspiring professional or seasoned photographer, Andy provides comprehensive tuition to suit all levels in a relaxed and enjoyable atmosphere. There is plenty of time throughout the workshop for one-to-one tuition when topics of your interest can be explored. We meet at 9.15am for an introductory talk at the National Trust’s Stackpole Education Centre and the day is then spent visiting various locations in the Reserve. Instruction is informal and conducted as we work our way around the ponds, woodland and beaches. The course finishes at 3.15pm. St. Brides Castle, our base for this Workshop, is a 19th century baronial country mansion, spectacularly set within the some of the most picturesque scenery of the Pembrokeshire Coast National Park. The Castle is surrounded by 99 acres of mature parkland and bordered by Old Red Sandstone cliffs which are stunning when bathed with evening light and assaulted by Atlantic surf. The woodland has a superb carpet of bluebells and red campion in the spring. The Marloes Peninsula is one of the top landscape destinations in the UK with impressive views over Jack Sound to Skomer Island and, just to the south, the majestic Marloes Sands. Wooltack Point is a particularly good location for watching porpoise and plunge-diving gannets and the coves are full of seal pups from late August to the end of December. The large tidal range here of almost 8 meters allows a stunning variety of marine life to be discovered in the myriad of rockpools exposed during low spring tides at St Brides Haven, a stone’s throw from the Castle. The area has a diverse range of coastal birds including the charismatic chough and soaring fulmar petrel as well as a number of raptors such as peregrine falcons which nest nearby. This workshop caters for all skill levels, from complete beginners to aspiring professionals. Your tutor is Andy Davies, a professional photographer and lecturer, who provides hands-on expert tuition to small groups who are initially taken back to the fundamentals of photography, rapidly progressing to having full creative control of either digital compact cameras with manual capability or digital single lens reflex cameras (DSLRs) with interchangeable lenses. There is plenty of time throughout the workshop for one-to-one tuition when topics of your interest can be explored. I recently visited St Davids Cathedral. A place I haven’t been to since I was a child-on a school trip. A Cathedral set in an idyllic valley within the Pembrokeshire Coast Path. What a lovely place to visit, it is full of history as well as being an active place of worship-it descibes itself as ‘A place of beauty, peace and pilgramage’, with a tag line of ‘Turning visitors into pilgrims’, which based on my experience, describes it quite aptly. St David, settled on this spot as place of worship in 600AD, and since then, for 1500 years this space has been offered for worship. The Cathedral has around 250,000 visitors per year and holds daily worship services. It is generally open from 7.30am-7pm, and there is no admission costs, they rely on donations from visitors. They recive no state income and are totally reliant on the income from the shop and donations. Music draws people apart from the historical significance and the Cathedral Choir sing daily in services. To maintain a choir of their standing from a village of 1500 people is quite a feat, especially with the commitment of daily attendance. In 2012 they restored the shrine of St David and local artists created 3 images and a canopy, which now provides a focal point for pilgrimage. In the summer they offer Pilgrimage walks around the St Davids Penninsula. They also have art exhibitions from time to time and at the Gallery area of the refectory, there are reguklar exhibitors in this gallery space. The Refectory is run as a franchise for hospitatlity, they use as much local produce as possible and have been awarded the Pembrokeshire Produce Mark by the local council-Pembrokeshire County Council. They are open all year round and serve a great bowl of Cawl, as proclaimed by Aled Jones! The clock on the tower is due to be fixed this year at an anticipated cost of £150,000. Due to it’s proximity to the sea and the weather we enjoy on the coast, the wear and tear it has endured has taken it’s toll. The people of St Davids have been lost without this, as many used it as their main means of time telling! The advice from the Cathedral is not to visit on a wet day in August, as this is when everybody is visiting and the peace of the Cathedral is hard to find when so full. My advice would be to take an official tour….without our excellent guide I would not have come away having such a fantastic experience. The history that is linked and has made the Cathedral is the mind blowing part of it for me- the tomb of Edmund Tudor- father of Henry VII(born in Pembroke Castle), grandfather of Henry VIII are here for all to see- some time ago they exhumed his body, which was still in it’s full armour, with the very shockingly red Tudor hair still visible for all to see. I find this of particular interest to myself, as I am currently working my way through the Philippa Gregory books about the Tudors, so it really does feel as though history is coming alive! I could give you many interesting and fascinating facts about the Cathedral and items you will find inside, but I think I will leave these for you to discover for yourselves when you take a tour…and please do! It’s Farmhouse Breakfast Week this week folks. This week was originally devised to highlight crop farmers in the UK and to promote a healthy start to your day. I LOVE cooking on my (now 64 year old) Aga!! I cook all my breakfast ingredients without the use of any extra added fat, my sausages are homemade by my butcher and have a high meat content and the Aga does a great griddled egg (similar to a fried egg but no fat is used), so you can truly have your Full Welsh (we are in Wales!) with a guilt free mind! I am proud to offer as much local produce as I can, which means that I am able to provide the absolute best quality for Breakfast, as you can see from the lovely guest comments on Trip Advisor! However, going back to the crop farmers, I also make my own Granola and, on request, I offer a fabulous homemade yoghurt soaked Muelsi-which is divine. You can feel the well-being flowing through you with each spoonful! And, you may remember, in April I was the proud recipient of the Pembrokeshire Tourism Award for ‘Pembrokeshire’s Finest Breakfast’, for which I was given a fabulous Steve Robinson piece of art, that proudly now stands in my hallway for all to see! A piece of art from Steve has been on my ‘wish list’ for quite a while, so as well as the recognition for my breakfasts, I was delighted to recieve such a beautiful piece! A snappy little video from Kayak King in Pembrokeshire, showing some of the beaches of Pembrokeshire. 20 Nov Do your Christmas Shopping while you stay! With Christmas approaching, why not combine our Weekend Walker Offer with a bit of Christmas Shopping?? We have for sale at Fields Lodge many local crafts-excellent porcelain pottery by Sheila Hickey, fabulously priced handmade jewellery by Rhiannon(and she can make to order any style or colour you would like), handamde occassion cards and Christmas Cards by Rhiannon, bottles of our very own Organic, aromatherapy, locally made toiletries and our ‘I’d rather be staying at Fields Lodge’ mugs! Enjoy a peruse through these lovely things with an afternoon tea, including our lovely shortbread mince pies, infront of our cosy, cwtchy real fire! Come on, what are you waiting for???? Mark & Howard stayed for 2 nights whilst on their Pembrokeshire Coast Path Walk. They were a pleasure to have as guests, and so enjoy their own quirky take on their journey! I have included the 2 videos that cover the parts of the path immediate to us here, but of course, there is much more easily accessible from Fields Lodge. It is possible to walk all the way to St Davids and still come back here to stay, should you so wish! I’m ashamed to say that it is only recently that I have discovered we have our very own Lovespoon Workshop in Pembrokeshire! lovespoons in 1969-the very first one he made was as a wedding proposal (which was accepted!) and since then, one special lovespoon has been made each year. These are all displayed on the walls around the workshop, and you can touch and feel these fabulous creations and understand the meaning behind the designs. There are some truly fantastic pieces here, and one of them is the longest Lovespoon in the world! And all made out of a single piece of wood! You can peruse all the lovespoon designs and choose one of your own that will then be engraved with either a date or initials as you require to make a truly personal gift. Bramleys cafe at Grandiflora Garden Centre isn’t too far away for you to have a coffee and some nice home made cakes too! We were surprised one morning this week to have a heard of cattle join us for breakfast! They had obviously heard that we had just won another award! The decided to have a close inspection of the rooms, giving some of the guests a bit of a shock when they opened their blinds and they also had a good taste of our lovely shrubs and flowers! They inspected all around by standing on the top of the Pembrokeshire bank, looking like the bulls you see on the Spanish mountains(if you’ve been to Spain, you’ll know what I mean!). Not content with one part of the garden, they decided to have a good rummage around everywhere! Luckily, I was able to escape, leaving Rhiannon to hold the fort, and dash down to the farmer to alert him! The farmer was a star, ushering all the herd out single handed, with me just stopping the cattle going up onto the main road, doing my mobile scarecrow impersonation! So, the poor garden looked a right mess, and the gardener was here yesterday digging up the small conifers that were trampled and snapped in two. So, we have a few gaps in the border now! The upside though, is that we had a few blooms to make a nice flower display for the lounge. I don’t like cutting flowers to bring them inside normally, but as the cattle had done the job for me, it would’ve been a waste not to use them as they looked so lovely! I ate out this wekk at The Harbourmaster on Milford Marina. For a Thursday night, I was surprised how busy it was-good job we had booked a table! It happened to be ‘Curry Night’, and although you could still choose from their standard menu, and their specials also, I decided to try their Chicken Balti (which comes with a free drink too!). There were plenty of people enjoying the evening sun on their large terrace overlooking the boats. We had a thoroughly great night, my friends chose Fish & Steak and their meals were good also and we had great service from very pleasant staff. Check out their website www.theharbourmaster.co.uk for a look around the premises and a sneaky peak at the menu! I am delighted to report that, this week, we have received another prestigious award from Pembrokeshire County Council-the Pembrokeshire Produce Award for ‘Best Use of Pembrokeshire Produce in a Hospitality Outlet’..woop, woop! I was presented with the award at a Breakfast Reception held on the second day of the Pembrokeshire County Show-the 2nd largest show in Wales. It was a typically Welsh wet day but this didn’t spoil the fun of the reception or the show! It is really great when you are recognised for going the extra mile to ensure you provide the best of things for your guests, as it is so easy to take a cheaper, simpler route-but that is not the road for me and my offering! The reception finished and I was whisked off to do an interview on Pembrokeshire Radio and had lots of photos taken(me in fancy dress as a drowned rat!) for the local paper and various other groups. I was delighted with the award, and the 2 bottles of Cwm Deri produce (one in the photo) that came with it! I have found an idea for Christmas Presents there, I think,-they’re lovely little bottles. The county show was great, if a little wet, and I spent an enjopyable time watching an Angela Gray demonstration of an unusual brunch dish that was very tasty indeed! Maybe I can add it to my breakfast menu??? Yesterday saw the start of Pembrokeshire Fish Week, voted one of the best food festivals to visit in the UK! The opening day is held at Milford Docks, an appropriate venue to start the week, with all the history Milford has with it’s fishing and trawlers. The atmosphere was brilliant, and thankfully the rain had cleared by the opening, resulting in a day for sunglasses. There was food galore and I was able to stock up on my favourite Caws Cenarth cheese and at last ‘Gethins Cyder’ from Haverfordwest now produces their cider in bottles, so that was a treat! Fire & Ice from Narberth were there with their alcoholic icecream & sorbets and Cafe Mor, who now have a resident hut in Freshwater, were there offering fabulous lobster and cockle cakes, amongst other things. There were plenty of places to buy your fish and contrary to the title of the festival, it’s not all about fish-there’s plenty of meat there too! The Fish Plaice where our superb Kippers for breakfast come from! I enjoyed watching a few food demonstrations by the lovely celebrity chef, Angela Gray-I am lucky enough to be going to a course at her cookery school in August. Angela had her work cut out though, as she was sandwiched between the Samba band playing one side and a motley crew singing sea shantys on the other, so i think she must’ve had a sore throat by the end of the day! There is plenty going on across the whole of the county in this week, either check out the website on Pembs County Council or pick up a leaflet to find something near you! 13 Jun Picton Castle – a quest for afternoon tea! I am attempting to find the best ‘afternoon tea’ locally, following a request from a forthcoming guest-‘ideally with nice gardens’….so Picton Castle came to mind! I am slightly ashamed to say I have never been here before, other than for a wedding, and at that point I really didn’t see anything other than the wedding venue! So, I collared my friend Gill into accompanying me on my quest…. Picton Castle is great, the gardens are fantastic and my ‘snaps’ do not do it justice! Plan to spend at least 4 hours there, I would say. The gardens cover 40 acres, there is a magical Walled Garden, with herbs you have never heard of, there’s a pond and a fantastic bluebell walk, which we just caught the tail end of. There is a very nice cafe there, and we enjoyed fantastic Tapas in the sunshine and we followed it up with a scone, cream & jam, but no traditional Afternoon Tea- you know little dainty finger sandwiches, 3 tier cake stand, loads of different little cakes, tea in a teapot…you get the idea?? So, Picton Castle DEFINATELY worth a visit, cafe definately worth trying but the quest for Afternon Tea goes on! 07 Jun Want to try something new?? I spent a morning at The Big Blue Experience (Tel: 07816 169359 ) this week. I met up with Ollie & Flora and they are based at Newgale (look for the Sands Cafe at the far end of the beach, north side-they’re just a few doors up). They offer a fantastic service of catering what you would like to do, activity wise, to the weather and your capabilities-that’s reassuring for someone who’s as unco-ordinated, nervous and unfit as me! And they can offer you a mixture of Kite Surfing, Kite boarding, Paddleboarding, Coasteering, Zap Cat rides (funky rib type boat!) and Power Boat courses! They will look at the wind and wave conditions and then communicate with you about the best places to go and things to do to make sure you have a fantastic day! They have all the equipment you need, just turn up with swimwear, sunglasses and a towel! The photo above is the north end of Newgale beach, a lovely sunny day and just look how much space you have…imagine zooming along here!! Ollie boy and I took a walk along the nature trail off Milford Marina. The trail takes you to Lower Priory where you can then pick up the cycle path, that will take you, traffic free, to Neyland and the BRunel Trail-which goes all the way to Haverfordwest- it’s a great cycle route and goes through some fab woodlands and green fields! The woods are carpeted with bluebells and campions, and in the river below, some swans have built a nest, right in the middle, away from the dangers of foxes. The path was quite deserted in the morning apart from 2 other dog walkers. It was a joy to be peaceful and just enjoy the birdsong along the way. Ollie found a large enough piece of wood to make him feel very proud of himself and her carried it all the way, most reluctant to drop it to get back into the car! Well, this week I was host to two ‘old’ colleagues of mine from my banking career-Mike & Peter, who were walking a piece of the coast path. I took them to Buccibar Indian, a new enterprise on Milford Marina. I can highly recommend this- 5 star surroundings, not your usual Indian, pleasant staff and no rush to get you out to resell the table. All the usual suspects on the menu and some new ideas too! I was a bit worried, as Peter is a bit of a curry expert, but he did say it was the best curry he had had!! Praise indeed. Great surroundings being on Miford Marina-put it on your list of places to go. And just look at the pickle tray, not your usual stainless steel job! And then last night, I was out with Gill for a catch up after her holidays, and we ate at Martha’s Vineyard-again at Milford Marina. Here I had the 4oz fillet wrapped in ham and topped with cheese-fabulous! So, again, another place to visit. Then just to top the week off, I am off to a Musical Sunday Lunch at Wolfscastle Hotel with my parents- so I shall report on that next time, although I am already expecting this to be stupendous! So much for my diet, but it’s all in aid of guest research-I can’t recommend somewhere unless I’ve tried it, can I?? ?